To some researchers, the lack of physical remains of Sasquatch type cryptids around the world may also be an indication of something otherworldly, and more along the lines of alien encounters. In this hypothesis it's believed there must be some sort of alternative explanation for why thousands of people witness presence of Bigfoot first hand, find tracks and DNA evidence, but haven't been able to capture an actual creature. It even suggests reasoning why photographs and video footage tend to have troubles obtaining unmistakably crystal clear images. The theory claims human-like cryptids are cross-dimensional beings who travel from another realm or dimension to visit our world for reasons we can't quite explain. Sasquatch could be observing mankind to determine an effect means of communication, or perhaps the species hasn't figured out a way to communicate with us beyond physical manifestation. Maybe what eyewitness find are distorted realities of another realm bleeding into the fabric of our own space-time continuum. 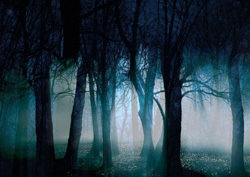 Some reports give the strong indication we might be dealing with cross-dimensional beings, such as a hunter taking aim and firing at a Squatch only to see it disappear into thin air at the sound of his rifle. If indeed Bigfoot is a biological form of this planet, those are certainly the most incredible reflexes known to exist. Ultimately researchers will continue to be confronted with a heightened level of mystery until such time these profound encounters can be logically explained.